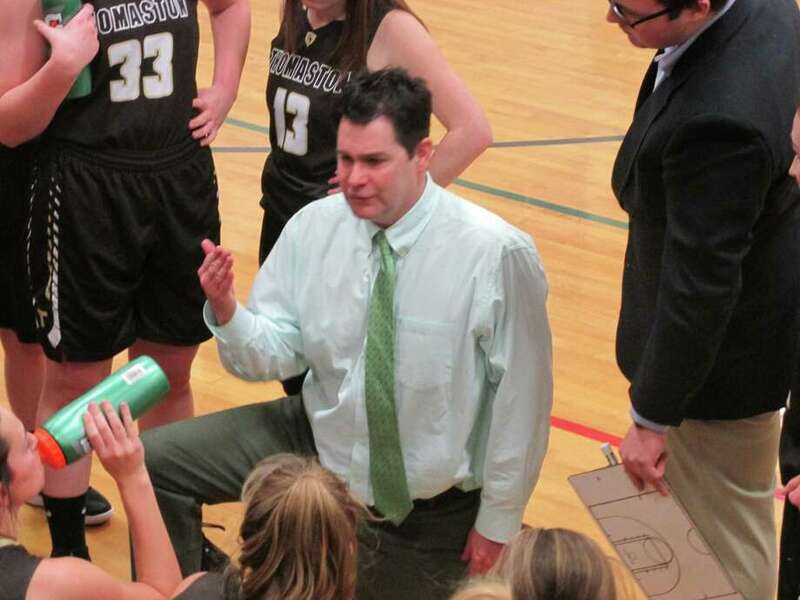 Thomaston coach Bob McMahon proved his young team has come a long ways with a resounding win at Lewis Mills High School Tuesday night. BURLINGTON — Thomaston’s young girls basketball team served notice that it’s coming of age Tuesday night with a 46-28 win over Lewis Mills. The Golden Bears (6-7; 6-5 Berkshire League) won two Class S state championships in five straight trips to the Mohegan Sun finals, then started over this year with just one senior on the team. Starting two freshmen, a sophomore and two juniors, the Bears lost by 18 points at home to Lewis Mills (9-4; 7-4 Berkshire League), one of three league preseason favorites, in their second game of the season. Matching up again Tuesday, after each team won three of their last four games, both teams struggled through a dismal first half of turnovers and missed shots — especially layups for the Bears — against cloying defenses. The Spartans played without their young point guard, sophomore Abby Mills, expected back soon from a broken wrist. Thomaston’s big girls, freshman Sydney Eggleston and sophomore Anna Calavecchio, helped give the Bears a marked rebounding edge, but the youth still showed in multiple missed layups. The first quarter ended 4-4; Thomaston had a 14-13 edge at the half. Playing their trademark in-your-face defense, sophomore Emma Kahn led the Bears defense by holding Mills star and Berkshire League scoring-leader Samantha Chadwick (9 points) to just four foul shots for the half, one field goal in the game. “It’s all about wanting to play — wanting to win the game,” Kahn said. Good things happened to the Thomaston offense in the halftime locker room. “You realize you’re playing for the whole team,” Colavecchio said. In the third quarter, Thomaston rolled. Kahn (game-high 16 points) hit two of her four threes for the game. Colavecchio’s inside moves paid off with six of her 10 points. Freshman Emma Sanson joined in with drives for six of her nine. By the end of the period, the Golden Bears led 34-23 and never looked back. Emily Hunt joined Chadwick with nine points, but Thomaston’s defense pressed even closer and now, the Bears found ways around a good Mills D.
“They’re a dangerous team,” Ciarlo said. “They’ve been working really hard in practice and it’s finally paying off for the team,” Thomaston coach Bob McMahon said. Emma Kahn 5-2-16; Sydney Stevenson 1-1-3; Emily Root 0-1-1; Anna Colavecchio 5-0-10; Emma Sanson 3-3-9; Sydney Eggleton 2-0-4; Megan Guay 1-0-3; Totals: 17-7-46. Lauren Alvarez 1-2-4; Brianna Pelchar 1-2-4; Emily Hunt 4-1-9; Annika Fitzgerald 1-0-2; Samantha Chadwick 1-7-9; Totals: 8-12-28. 3-point goals: T — Kahn 4; Guay.